I'm really excited to share with you guys my updated craft/sewing room today! as you may have read already, I had quite a clean out in here a couple of weekends ago; there was mess and then chaos and then more mess and then thankfully it came together rather nicely, if I do say so myself! So I decided to replace my Ikea trestle desk legs in favour of the Antonius drawer units. They're made of steel so I figured they would be a great support for my desk top, and heavy machine. I've been using it for about a week now and I'm so glad I got them! 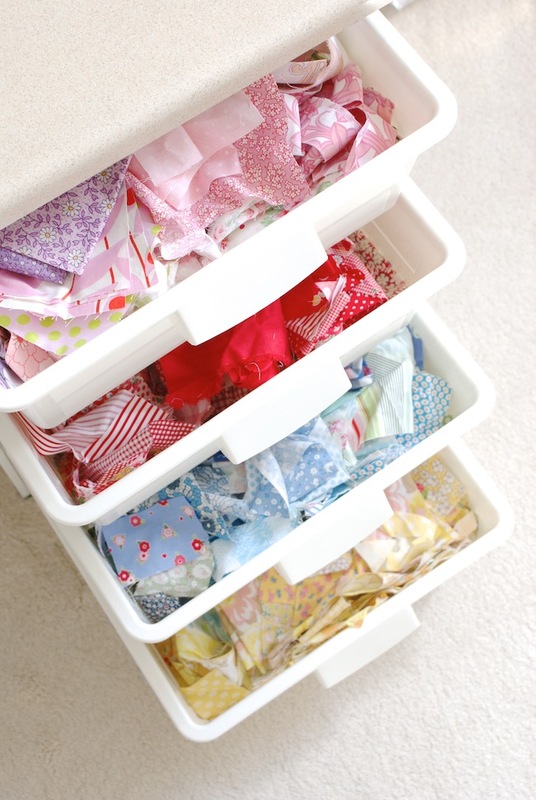 Not only are they full of storage space, they are slightly lower which makes sewing much easier!! 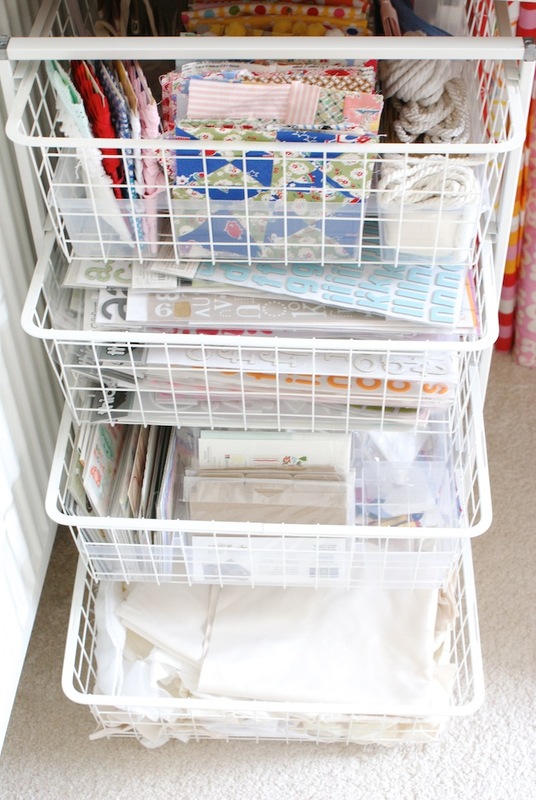 I got one unit with four wire baskets to hold my paper-crafting things and some of my sewing bits and bobs and my neutral solid scraps that I always use. For the other unit I purchased the Antonius frame only, and four of the small matching drawers. In here I hold all of my scraps by colour; pinks/purple, red, blue/green, yellow/white/brown/grey. ahh I just love it, the layout of £48 for both has been completely worth it just to have all my scraps nicely organised! It's made tidying up after a project a breeze now. These Antonius basket inserts are great for organising little things. I found that you can fit two of these inserts per basket, (not the Antonius drawers though) and because they're clear you can see exactly what's in them. At only £1.70 each I thought they were a great buy so I bought a bunch of them to store on my regular shelves too! This one holds all my hexies! Above my desk I now have a rail system in place to hold all my sewing necessity items like rotary cutters and scissors close by. These are the Ikea Fintorp rails with matching buckets and hooks. I love having my craft things out on display and easy to grab - there's nothing worse than digging through boxes and baskets finding a stitch ripper is there? so this works great for me. On the other side of the room, I have culled alot of my stuff and cleared out a whole Expedit unit! I was beginning to feel quite cramped in here and I really needed more floor space when laying out quilts etc so it was time for a change. It was mainly books I stored, so Robin built us some shelves in our living room to house them, free'ing up a lot of much needed space! I now just have this old ikea ladder shelf, to store some books, sewing patterns etc as well as my paper storage unit. I'm planning to change this area just as soon as I find myself a nice high-backed rocking chair (just missed out on one on ebay, deep breaths...) to fit nicely in the corner. I think it would be a great little snug place to do some english paper piecing, next to my fire :) I also want to hang a design wall up at some point as I have a lot of wall space now. Such a beautiful room! You did an amazing job. I would never ever leave. Wow! You are so beautifully organized. It's a great space! 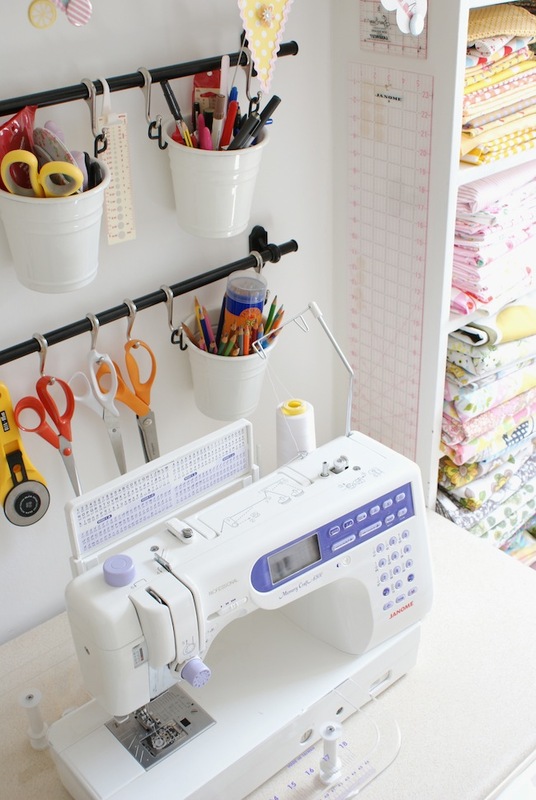 Ooh, I have craft-room envy! That's a great space and I love how you've used the storage so creatively. Wow!!! It is little sewing heaven! :) Wondeful place :) J.
Wow it looks stunning, and so neat and tidy. 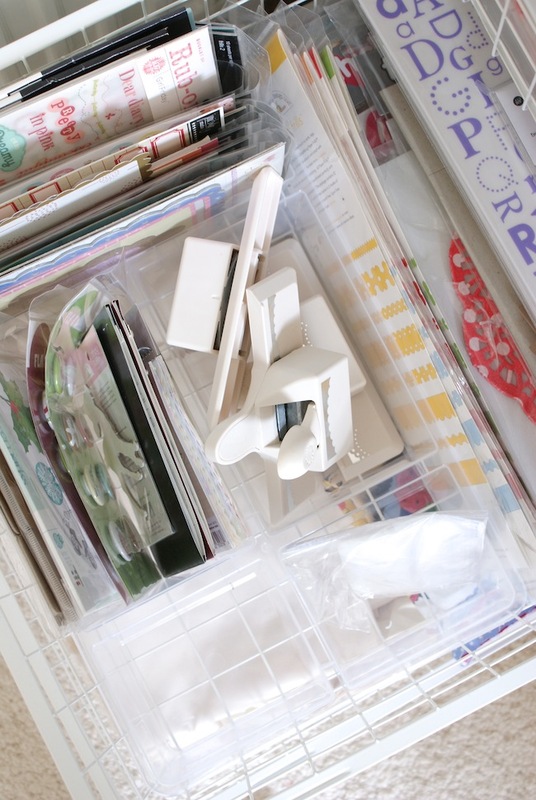 My sewing space is just a big pile of things all over the place! What a wonderful space. Full of light and inspiration and a home for everything. 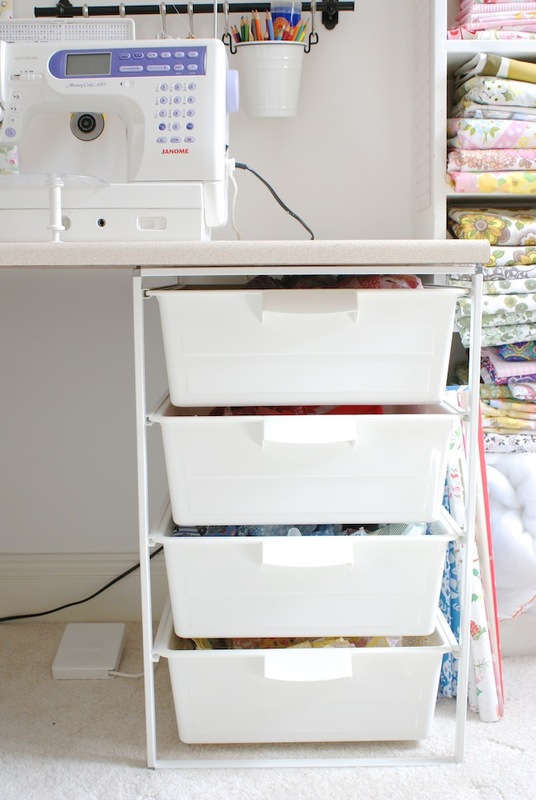 It's everything a sewing room should be. It looks fabulous!! I also received my fabrics from you this weekend.I LOVE THEM ! Such a beautiful and inspiring work space!! I LOVE it!! The sweetest room ever! So fresh. I love those rails and hooks for scissors etc...what a nifty idea! 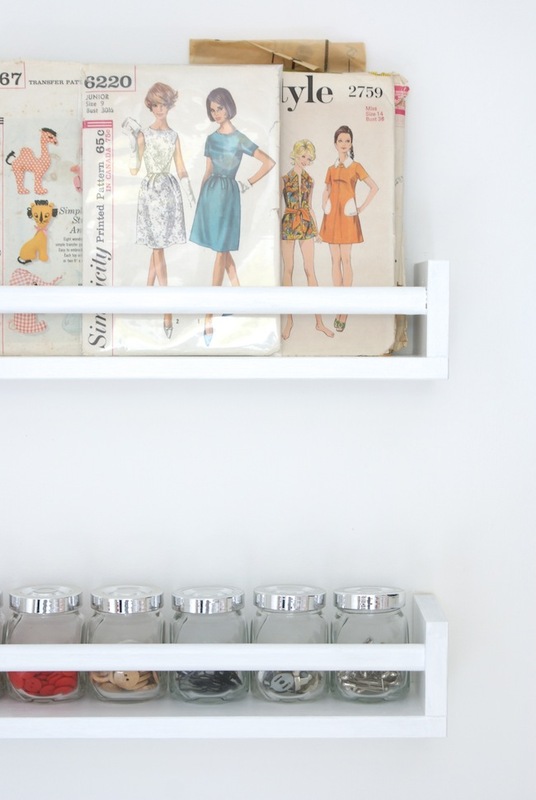 I especially like the spice racks to patterns, what a great idea! Really nice. I love Ikea. It's beautiful! I have sewing room envy. I love how ikea solves so many problems. Thank you for sharing. I'm coming back to this when I get to set up my space in house we actually own. Looks fabulous, organised and not messy at all! It looks fantastic...I am in the middle of doing mine. I wan to go to ikea, maybe it will be a birthday present but I sure do at least need to get more organized. I have taken before pictures so now i will take after pictures when it is done....thanks or the incentive. Your room is so bright and cheery but I do worry that the light from the window will leave fade marks on the folds of you beautiful fabric stash. Hello!! 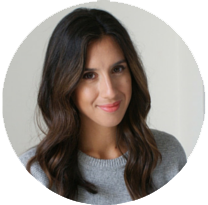 I love your blog, I am totally in love with your studio. I am in the middle of doing mine to give me some inspiration to actually start working properly on all my WIPS. Can I ask where you got your desk from? I am really loving the size of it. Wish I could get my room to look this good. What a wonderful space to create! so much beautiful in one spot! looks like a wonderfully inspiring place for creativity!